Turn an overlooked closet into a home office. 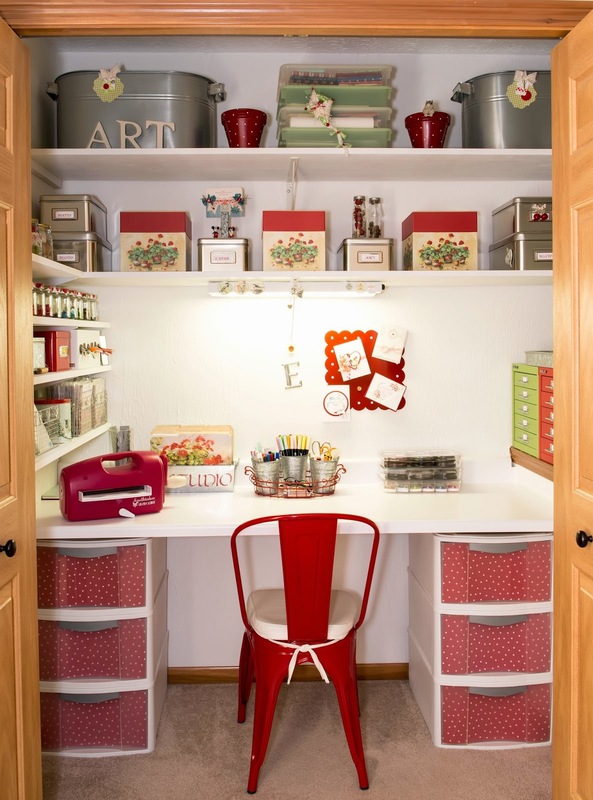 A little time, energy, and creativity can turn a forgotten storage area into a functional workspace. Here are nine tricks to transform a cluttered closet into a usable spot in your home. 1. Create a clean slate. Removing everything (yes, everything!) from your closet provides a clear idea of what you’re working with, allowing you to visualize an office nook of your dreams. Need help deciding what to keep and what to pitch? Make three piles: storage, donate, and garbage. Haven’t worn that jacket in three years? Toss in the donate pile. Is that blanket covered in holes? It’s time to pitch it. 2. Ditch the door. Removing closet doors instantly create more space and allow you to comfortably use your office nook. Dreaming of a bit more privacy? Unhinge doors and replace with a shower rod. Then, add curtain panels for an easy, stylish way to add privacy without making you feel cramped. 3. Paint it! Adding color to the walls is an affordable way to instantly transform a closet into a personalized office space! Since closets tend to lack natural lighting, choose a paint color with a low light reflectance value (LRV), which measures the amount of visible and usable light that reflects from (or absorbs into) a painted surface. Simply put, LRV measures the percentage of light a paint color reflects. 4. Let there be light. When converting a closet into an office, a little light makes a world of difference! Closets are notorious for poor lighting. Brighten things up by adding a charming chandelier, and don’t forget some practical desk lighting. On the hunt for budget-friendly lighting solutions? Check out a local Habitat ReStore for one-of-a-kind finds. 5. Contain clutter. Office storage is key! Weighing your options? Be realistic -- those charming hanging folders may be cute, but will you actually use them? An attractive letter tray may be more functional. Paper boxes help keep things tidy, and magazine files are an affordable option for keeping your desk clutter-free. 6. Look up. Designers agree: Use vertical space in small areas! Adding shelves above your desk will combat clutter and provide functional storage. Drawing your eye upward elongates the space, creating an illusion of a larger area. Hanging a vertical magazine racks utilizes wall space, and works great for bills and letters. 7. Go green. Ensure your office is a happy space and boost your mood with some a few potted plants. Missing a green thumb? No-fuss succulents (and hey, artificial is okay!) still add a little life to small office spaces. 8. Work your walls. Turning a closet into an office is easy when you utilize your three walls! Think outside of the box: Try a pegboard to keep things organized and visually appealing, or use hanging plant holders to store pens and pencils. Feeling small? A vintage mirror adds charm and creates the illusion of more space. 9. Cut a rug. Need a finishing touch? Add texture and color with a patterned rug. Small rugs can be found in any atheistic. Bonus: Since you’re working with a small space, you’ll get a large dose of style for a fraction of the price of a large area rug!